The Flemish Schneider and the Dutch Bax will fight a real Benelux grudge match, whether they want to or not. Instead of a steel cage, they will fight it out in the Dutch wetlands, using their weapon of choice: rifles with sniper-scopes. They are both hitman contracted by their agent to rub out each other in Alex van Warmerdam’s Schneider vs. Bax (trailer here), which releases today on DVD from Film Movement. Schneider is a family man, with two adoring young daughters and a lovely wife who thinks he works as a troubleshooting engineer for a filling station company. The crusty booze and narcotics soused Bax is also sort of a family man, but his semi-estranged grown daughter Francesca bitterly resents him for being a chaotic, ineffectual parent. The hung-over Bax forgot Francesca will be visiting his ultra-white Ikea-looking cottage, so he will have to evict his young gothy lover tout suite. It also slipped his fog-encrusted mind that the shadowy Mertens would be luring his target right to his doorstep this very same morning. Although his head is clear, Schneider is also having a hard morning. 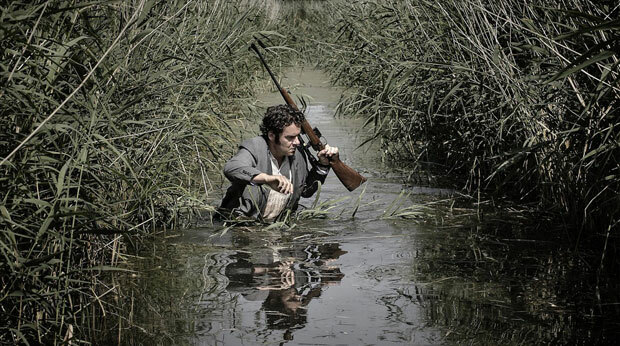 Since Martens neglected to tell him the surrounding marshes were protected, the visiting team hitman got spotted by a nature warden. That forces Schneider to return to his storage facility to change his disguise and vehicle. Things get even more complicated when a prostitute breaks in, hoping to hide from her abusive pimp. 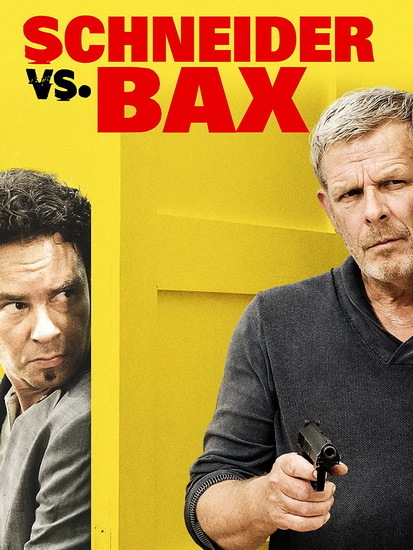 Schneider vs. Bax is sort of like the art-house theater version of Mad Magazine’s “Spy vs. Spy,” but van Warmerdam’s conception of slapstick humor truly has existential bite. The Dutch marshland is also wildly cinematic, adding something to S v. B akin to what the East Texas scrubland did for Blood Simple. Thesp-helmer van Warmerdam is wonderfully cynical and dissolute as the world-weary Bax. In contrast, Tom Dewispelaere is rather rigid and aloof as the detail-oriented Schneider. They clearly have very different approaches to their job. Of course, nobody is really in the right here, but the survivor survives. Frankly, we are not intended to take a rooting interest. Instead, we should really just relax and enjoy as van Warmerdam rains down one-darned-thing-after-another on his morally compromised characters. As soon as you get into the spirit of it, S v. B really is jolly fun. Van Warmerdam pulls off quite a feat of traffic direction, maintaining the almost farcical skulking in and out of bogs, around and under the cottage. The vibe approaches the Marx Brothers’ A Night at the Opera, as reconceived by Quentin Tarantino. Highly recommended for fans of darkly comic capers, Schneider vs. Bax releases today (10/25) on DVD, from Film Movement.